Dr. Grigorian’s specialty puts him in touch with many who have severe vision problems. He and his staff often go out of their way to help patients understand their disease and the resources available to them. His involvement is evidence of his focus on the patient’s quality of life. 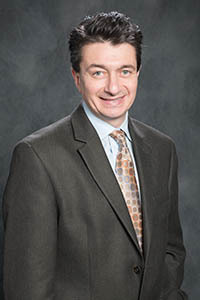 He is Board Certified in Ophthalmology and his specialty includes diagnosis and treatment of diabetic eye disease, macular degeneration, retinal detachment repair, macular holes and ocular trauma. He holds an MD degree from Yerevan State Medical University in Armenia and completed his Internship and Residency at the University of Medicine and Dentistry of New Jersey. He completed a Vitreo-Retinal Surgery Fellowship at Louisiana State University of Medicine in Baton Rouge. Internationally he has participated in medical missions to Armenia, teaching resident surgeons and assisting in the surgical care of adults and children. In working with those with serious eye diseases and disorders, Dr. Grigorian is always on the forefront of treatments that can slow or halt the progression of degenerative eye diseases.